This is where the 121 Group of Restaurants draw the concept for their new café-bar Salamangka. 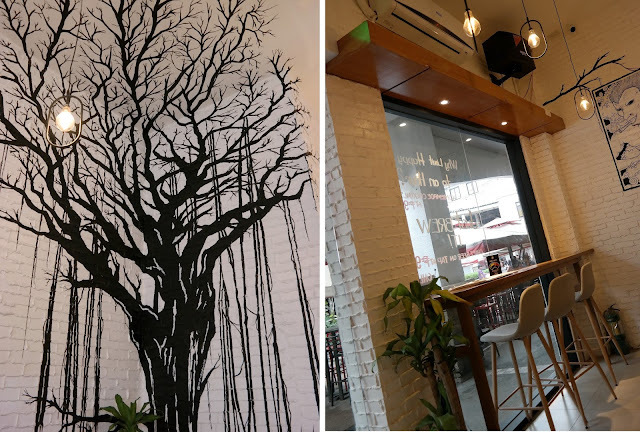 Having opened in July 2018, Salamangka is bridging specialty grade coffee, homemade cocktail infusions and Engkanto craft beer on tap. 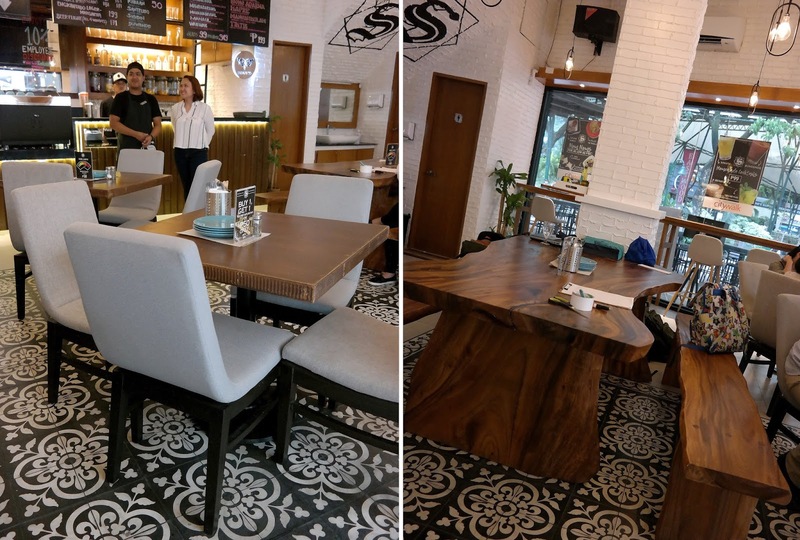 Salamangka aims to be your third place - whether you are craving for your morning coffee, a satisfying lunch, a happy hour craft beer, a tasty dinner or late night cocktails with the barkada. The concept of Salamangka is inspired by Filipino mythological folkore, while its menu incorporates casual cafe food with Filipino twists. Food specialties included corned beef mac and cheese, Coca-Cola wings and Ta-Pi-Log (tapa, pita and itlog), among others, while specialty coffee highlights are single origin pour overs from Ethiopia and Costa Rica, Choc Nut lattes and the Kapeko 3-in-1, a perfect gateway specialty coffee drink for drinkers whose palates like 3-in-1 coffee. House spirit infusions pair gin, vodka, tequila and rum with ingredients like dried mangoes, oranges and even Thai chili! Regardless of what is ordered, you are sure to experience and taste magic at Salamangka. The space that Salamangka occupies in Eastwood Citywalk would be familiar to a lot of you since this place used to be Distillery. I won’t forget this place as this was a place that is memorable to me. It’s both a good and bittersweet memory. But just like it, Distillery had to bid goodbye, make space for something new and create better memories. The atmosphere inside Salamangka is just like other posh coffee shops you’ve probably been to, but the Filipino folklore touches are very evident especially with the murals on the wall, wood furniture especially the huge communal narra table at the center of the restaurant. I personally love the vintage industrial light fixtures hanging from the ceiling and the bar tables and high stools that line the entire glass wall of the establishment. Now let’s get on with what Salamangka has to offer. Let’s begin with their Specialty Coffees. Specialty coffee is high grade coffee (less than 2 percent of the coffee in the world!) that has traceability of origin. Apart from the standard coffee menu (ranging from espresso to white coffees like flat whites and an amazing mocha), Salamangka’s signature coffees include the Kapeko 3-in-1, Bulletproof coffee (for the active crowd), Choc Nut Latte, Coconut Latte, Cold Brew and Coffee Ale. All coffee products are made with only the finest ingredients, from single origin coffee to premium milk. Salamangka is confident in saying that its coffee products are the best in Manila. One taste proves it all. Flat White - A flat white is an espresso-based coffee drink consisting of espresso with microfoam. The coffee in here has a strong and bold flavor. At the same time it’s also quite creamy and had a good foam on it. Kapeko 3-in-1 - when I was asked what coffee do I want, I said I want something sweet. Ms. Jasmin said the Kapeko would be perfect for me. The Kapeko took after the Filipino staple 3-in-1 coffee drink that comesin sachets, but of course, Salamangka uses quality coffee for this drink. I love how it tasted just like the 3-in-1s that I always drink but the flavor is way forward. Another thing that I immediately liked about Salamangka is that they don’t use plastic stuff, they use bamboo straws instead. Plus points for that. Now on with the food. 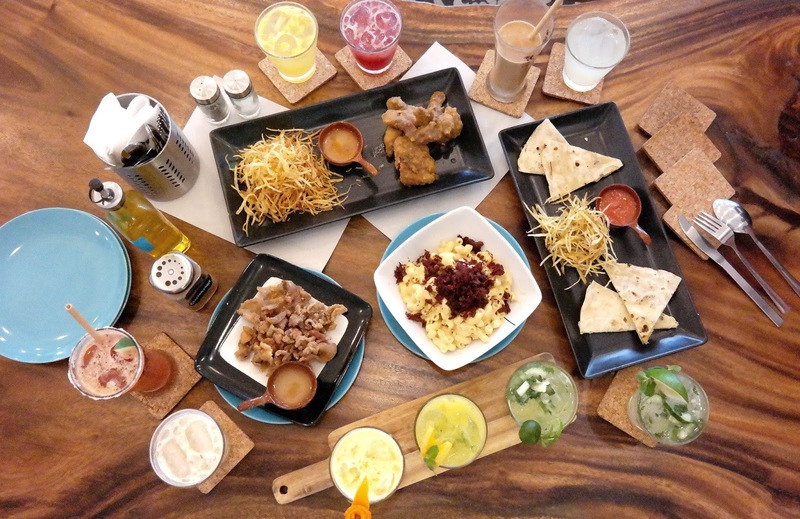 Salamangka's Comfort Food menu incorporates casual cafe food with Pinoy twist. Their menu truly complements your drink of choice, whether it be a coffee, a beer or a cocktail. Tapang Baboy - deep fried pork tapa served with Pinakurat vinegar. *Sigh* this chicharon-like pika-pika is soooo addictive, by itself or dipped in vinegar. If you'll ask me, I'll probably eat this with rice. This would be super perfect with cocktails and beers. Itlog Na Maalat Pakpak - salted egg chicken wings served with piknik. I personally love salted egg, you can even catch me eating it with hot steamy rice. That's why I like any dish that comes with it. I liked how the salted egg is incorporated well with the coating for the chicken wings so you can really taste the flavor. Kinda spicy but works well for me. Piknik - hand-cut fries and served with 3 different sauces. Nope these are not the ones that you buy at groceries. They are fresh, hand cut and deep fried in store potatoes. What's good about it is that it tastes exactly like the commercially produced ones. They are addictive as well and a great combo with booze. Corned Beef Mac and Cheese - crispy corned beef flakes on top of o bed of cheesy macaroni. Salamangka’s house specialty! I love how cheesy and creamy this was. The corned beef gave it a good texture. Keso At Bawang Quesadilla - grilled cheese and garlic quesadilla served with piknik. Oooh I love garlic, I love cheese, put them together and I'm smitten. I like how balanced the flavors were. I can see myself munching on these like there's no tomorrow. Salamangka’s Homemade Cocktails are reinforced by the homemade infusions that they make that are crafted and matured in-house. These native infusions vary, pairing gin, vodka, tequila and rum with ingredients like dried mangoes, lemon peel, raisins, oranges and even Thai chili! Best of all, the majority of their cocktails only cost PHP 99! Perfect as a beer replacement. Glass orders are priced at PHP 99 and pitchers are at PHP 349. Bungisngis - gin, lemon, raspberry preserves. Diwata - orange infusion, orange extract, cream. Ermitanyo - Kibaann raisin infusion, lemon, crushed nuts. Magindara - Santelmo lemon infusion, lemon extract, Sprite. Mambabarang - gin, lime juice, cucumber slices, mint leaves. Manaul - Duwende mango infusion, vodka, lime. Manananggal - vodka, Calamansi, cucumber, mint leaves. Aswang - Undin roasted bell pepper infusion, lime juice, tomato juice, Tiyanak chili infusion and Worcestershire sauce. Wakwak - rum, lime juice, mango puree, mint leaves. Ibong Adarna - tequila, pineapple, Calamansi, chili. Besides their catchy names based on Filipino mythical creatures and legends (which you can read more about here if you're interested to learn more), these Salamangka’s Homemade Cocktails taste really really good! Some are too strong for my liking but I loved the Diwata, Wakwak and Manaul because of their extra fruity flavors. The Mambabarang and Mananangggal are good too as they reminded me of my favorite mojito. These cocktails are a must try! All of Salamangka’s Craft Beers are by Engkanto Brewery, the finest microbrewer in the country. They have four standard craft beers on tap, specifically the Lager, Pale Ale, IPA and Double IPA, all carrying the tropical characteristics that make Engkanto beer perfect for the Filipino drinker. Their beers begin at PHP 99 per glass, which is a steal anywhere in the city. My personal favorites are the IPA and Double IPA because they were fruity as well and had a really sweet aftertastes. Native Infusions are crafted and matured for a week in Salamangka and can be ordered per shot which is only PHP 50 each or try all the 7 varieties: Undin - roasted bellpepper vodka. Tiyanak - Thai chili tequila. Kibaan - raisin gin. Santelmo - lemon vodka. Sigbin - orange vodka. Duwende - dried mango rum and Nuno Sa Punso - spearmint chocolate vodka, like an After 8. Man, I’m telling you these infusion shots are super strong. They are good but they’re gonna give you a super good kick. 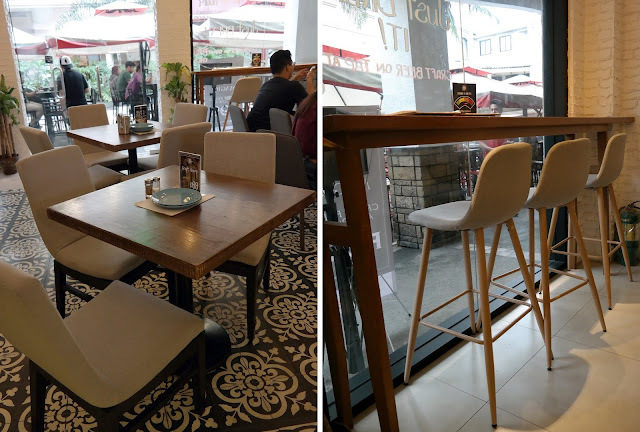 Don’t be intimidated by the upscale looks of Salamangka, because what they have to offer is very good and affordable as well. If you want to taste magic through our homemade cocktails, craft beer and specialty coffee, try Salamangka’s products and service, and escape reality for a quick bit, unwinding with their beverage of choice and good company. They’re open from 7:00 am to serve you good coffee and meals throughout the day and they come after work for some post work destressing as they close their doors at 3:00 am.